A welcome and functional addition to any kitchen, this Cavaliere-Euro Stainless Steel and Glass Island Mounted Range Hood features a six-speed electronic LED control panel for easy operation. It also features a powerful 900 CFM centrifugal blower that works just as well as many industrial models. Maintenance is easy with a six-layer aluminum grease filter that can be cleaned in a conventional dishwasher. It has ample lighting with four 35-watt dimmable halogen lights and a telescopic chimney will fit ceilings that measure from 96 to 108 inches in height. 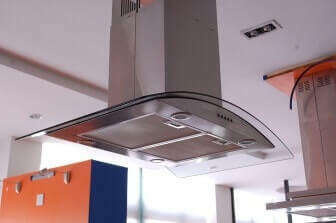 With an extra extension that you can purchase, it can accommodate ceilings up to 10 feet. This unit is constructed from high quality 19-gauge stainless steel and is designed to enhance the look of a kitchen with contemporary elegance and style. It also has a timer and a clock. This is one of the heaviest range hoods you'll find, as it weighs in at just over 100 pounds, so it will take more than one person to install. Also, if you are not a seasoned do-it-yourself'er, you may find the instructions a bit on the confusing side. As with many of these models, drywall anchors tend to be weak and will require reinforcement. 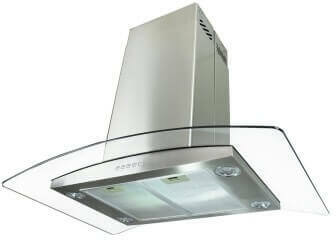 This Cavaliere-Euro Stainless Steel and Glass Island Mounted Range Hood has exceptional power, as it is comparable to industrial models in performance. This is a fairly new product so it does not have a lot of reviews, but the ones that are out there are very favorable. 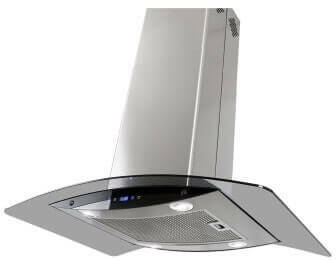 You won't find a more powerful and stylish range hood for your kitchen, but since it is a considerable expenditure, you want to read some of the reviews that are available before you place an order.